“The King of Rock ’n’ Roll”? 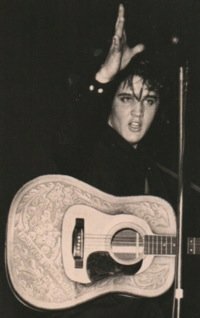 Every so often a viewer of elvis-history-blog.com uses the “Comment” button to sound off about Elvis Presley’s right to be called “The King of Rock ’n’ Roll.” Most, like Cooley, don’t believe Presley’s contributions to the new music of the fifties warranted him being designated its “King.” Of course, this is just a matter of opinion. We’re not talking about an official title bestowed by the U.S. government or anything like that. “The King of Rock ’n’ Roll” is just one of many labels journalists slapped on Elvis in the fifties. (“Elvis the Pelvis” was another popular one.) So, although it seems of little importance, let’s go ahead and address Cooley’s concerns. 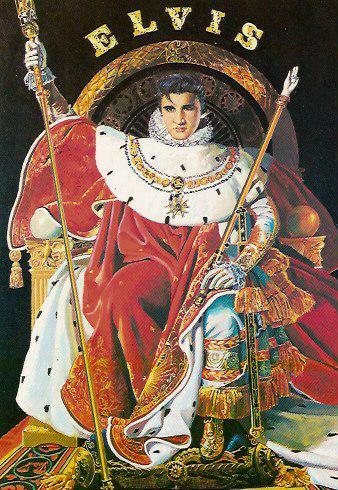 Let's start with when and why Elvis was first awarded the crown. I dug into my file of Presley newspaper articles to see if I could discover when that term was first applied to Elvis. As rock ’n’ roll was first cranking up in 1955 and early 1956, journalists who covered his personal appearances were referring to Elvis as a “country” or “hillbilly” singer. It wasn’t until his popularity rapidly increased following his early 1956 national TV appearances and RCA’s release of “Heartbreak Hotel” that writers began associating him with the rock ’n’ roll trend. Then, as he began attracting ever bigger, more enthusiastic crowds, reviewers of his shows started to attach labels of all sorts to Presley. After an April appearance in Oklahoma City, reporter Jack Jones called Elvis a “king of the teenaged cats.” That same month Waco Times Herald writer Bea Ramirez referred to Elvis as the “new king of the rock ’n’ roll set.” As far as I can tell, though, the person who first anointed Elvis Presley with the royal title in question was Robert Johnson. In a lengthy article about Memphis’s favorite son in the Press-Scimitar on May 4, 1956, Johnson branded Elvis, “the fledgling king of rock ’n’ roll.” From then on, journalists in other cities began to attach the same label to Elvis. What criteria did Johnson use in giving Presley such an exalted title? It was simple—his popularity. Johnson pointed to the crowds Elvis drew to his shows, the amount of money he was making, his record sales, his new Hollywood contract—all areas in which he far outstripped any other rock ’n’ roller in the nation. Just a couple of weeks later Billboard magazine declared Presley the “first ‘double-Triple Crown’ winner in the history of The Billboard’s record charts.” His “Heartbreak Hotel” was #1 on six different charts spread across the pop, country, and rhythm and blues categories. So, there you have it. 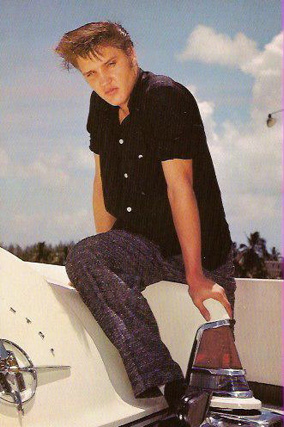 Elvis earned the title “The King of Rock ’n’ Roll” by winning a popularity contest. Neither he nor anyone else in the industry declared him the most talented singer, the best guitar player, or a gifted songwriter. He became the “King” because he drew the largest, most enthusiastic crowds and sold more records than any of his rock ’n’ roll contemporaries. And that continued throughout the 1950s. I don’t think Cooley or any of Elvis’s other detractors would dispute that he was by far the most popular rock ’n’ roll star of that era. Now, Cooley might say that other factors should have been taken into account in awarding the high title of “The King of Rock ’n’ Roll.” What about Chuck Berry’s songwriting, or Buddy Holly’s guitar work, or Little Richard’s energetic delivery? Unfortunately, such talents are difficult to quantify. In some immeasurable way, they probably drew bigger concert crowds and increased record sales, and that brings us back to popularity again. • Did Chuck Berry deserve the crown instead? Well, if Elvis didn’t deserve the title of “The King of Rock ’n’ Roll,” then who did? Cooley didn’t offer another candidate, but after my blog about Chuck Berry last year, an incensed reader informed me that Berry was the real “King.” OK then, let’s compare the two rockers and see which one really deserved the crown. First, let’s lay down some ground rules. Since the title was bestowed upon Elvis in the 1950s, let’s restrict the comparison to what the two men accomplished in the latter half of that decade, when rock ’n’ roll music formed and burst into popularity. Today, Berry is recognized as one of rock ’n’ roll’s best early songwriters, perhaps equaled only by Leiber and Stoller. The reality is, however, that in the fifties, when the title of “The King of Rock ’n’ Roll” was up for grabs, the teenage masses cared about the music, live rock ’n’ roll shows, and dancing. They didn’t know or care who wrote the songs. Billboard’s charts indicate that Elvis's music was far more popular with teenagers in the fifties than Chuck Berry's. What about live stage shows? By February 1956, Elvis was headlining his own shows. During that year he toured the country, performing 143 concerts in 79 different cities. The crowds multiplied in size and enthusiasm as his popularity grew. In 1957 Presley played to huge crowds in large arenas and outdoor stadiums. Meanwhile, Chuck Berry, also a dynamic live entertainer, was touring the nation as one of many acts in the various “All-Star” shows organized by Alan Freed and other rock ’n’ roll promoters. Each of the performers in these shows was allowed about 15 minutes on stage before giving way to the next act. While Chuck Berry and other rock ’n’ roll founders, like Buddy Holly, Jerry Lee Lewis, Little Richard, Sam Cooke, The Everly Brothers, and Fats Domino, drew large crowds as a group, none of them individually could attract the multitudes to their stage shows that Elvis did. And consider this. During the 1950s, Elvis had 16 records in the top 5 of Billboard’s chart. That’s as many as the other 7 rock ’n’ roll legends listed above had combined. Also, 8 Elvis songs reached #1 on the chart, while the other seven had only 3 chart-toppers between them. And let’s don’t forget that Elvis starred in three classic fifties rock ’n’ roll movies—Loving You, Jailhouse Rock, and King Creole. The others—none. "In a lengthy article about Memphis’s favorite son in the Press-Scimitar on May 4, 1956, Robert Johnson branded Elvis, “the fledgling king of rock ’n’ roll."